Ellen graduated from the Australian National University in 2015 with a Bachelor of Laws and a Bachelor of Arts (Politics/International Relations). After receiving special dispensation to start her Graduate Diploma in Legal Practice early, she was admitted as a solicitor in April 2016. She is now completing her Master of Laws, also through the ANU. 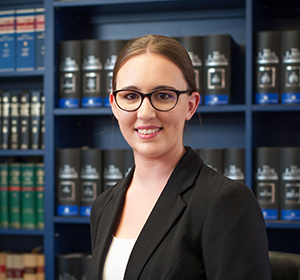 Prior to joining Colquhoun Murphy, Ellen worked in personal injury and superannuation litigation for over 7 years, and has a particular interest in assisting clients with disabilities and those unfamiliar with the legal profession to navigate all aspects of litigation. Ellen now works for clients in all areas of civil and commercial litigation and assists with wills and estate matters. She takes the time to understand her clients and work with them to find the best solution for their problem. Ellen is a current member of the ACT Law Society’s civil litigation committee, helping the committee with law reform and practice guidelines for the legal profession, as well as liaising with related organisations and the government. Her clients benefit from her experience and contacts in the ACT courts and the wider legal community. Ellen is a member of the Australian Lawyers Alliance and the ACT Women Lawyers Association.